Scientific name : Syzygium aromaticum L.
Cloves have been regarded as the most venerable of spices since antiquity. In China 266 BC, guests of the Emperor would be required to hold cloves in their mouth when speaking as to bestow a pleasant odor. Clove essential oil is utilized extensively in dental care, added in various toothpastes, mouthwashes, and oral medication. Not only does it contain analgesic properties (pain relieving), it also is strongly antimicrobial and antibacterial, a perfect combination for combating toothaches and other teeth related ailments. Apply a drop of clove oil to your toothbrush and feel the tingle as it cleans your teeth. When a drop is added to a pained tooth, it will immediately dull the pain. 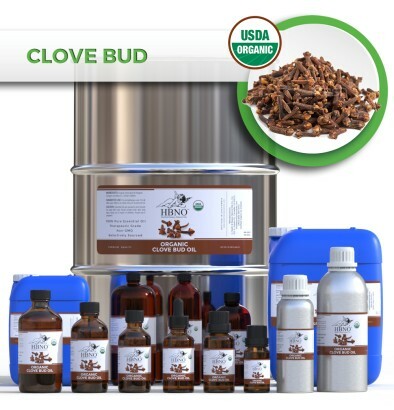 Clove bud essential oil is a versatile oil with myriad of applications. Clove bud oil is an excellent addition to cosmetic applications, personal care formulations, soaps, perfumery, dental care, and aromatherapy. HBNO is pleased to offer clove bud essential oil in bulk and wholesale quantities. We can supply any amount of oil to anywhere in the world.